The Best Jazz Guitars in 2019: reviewed and rated here! Whether you’ve been into jazz most of your life or have recently gotten into this music style, the best jazz guitar will surely jazz things up for you. If you’ve been dreaming not-so-little dreams of a jazz guitar of your own, this list of five fantastic models can help make those dreams come true. We’ve picked out the best offerings from some of the most trusted guitar companies in the world today. These guitars are carefully chosen based on their jazzy sound quality, build, playability and value for money. Choose the one that appeals to you most and get grooving! Fender Classic Player Jazzmaster Special Pau Ferro Electric Jazz Guitar From its name alone, the Fender Classic Player Jazzmaster Special presents itself as the ultimate jazz guitar. This electric guitar is a modern take on the classic Jazzmaster model and features an alder body, a maple neck with a pau ferro fingerboard, an Adjusto-Matic bridge and dual special design single-coil Jazzmaster pickups that are guaranteed to be hotter than ever. 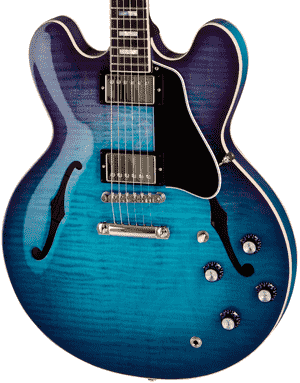 Gibson ES 335 Electric Jazz Guitar Up next is one of Gibson’s best jazz guitar offerings, the ES-335. 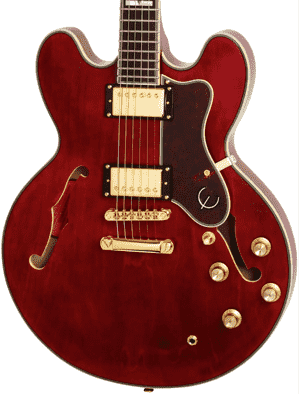 This semi-hollow electric guitar comes in Studio, Dot and Figured models. For this list we’re recommending the ES-335 Figured model, which features a beautiful AAA figured maple veneer top, mahogany neck, ABR-1 bridge with titanium saddles and custom-voiced Gibson MHS humbucking pickups for that wonderfully sweet jazzy tone. Epiphone Sheraton-II PRO Electric Jazz Guitar Another semi-hollowbody guitar on the list is the Epiphone Sheraton-II PRO, a great alternative to the ES-335 for budget-conscious players. It has a maple laminate body and top, a maple-walnut laminate neck, a rosewood/pau ferro fingerboard and ProBucker 2 and 3 pickups. Coil taps at the bridge and neck volume knobs allow for a wider range of jazzy sounds. Ibanez Artcore AS73 Electric Jazz Guitar If you’re looking to try something other than Gibson-Epiphone semi-hollowbody guitars, check out the Ibanez Artcore AS73. It costs less than the Sheraton-II PRO but offers nearly the same looks and sound. It has an all-maple body, a mahogany neck, a bound rosewood fingerboard and a pair of Classic Elite pickups that efficiently captures both acoustic resonance and electric sound. 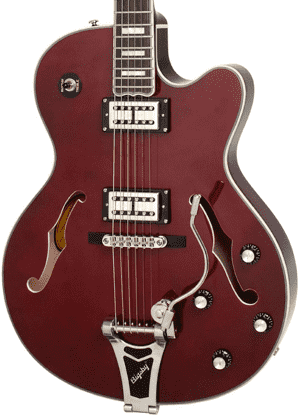 Epiphone Emperor Swingster Electric Jazz Guitar Now we have a hollowbody electric guitar that will make you swing like a pro. The Epiphone Emperor Swingster features a classic design, with its body and neck being the same as those used on the Emperor-II model. It also has Epiphone Swingbucker pickups and you can pull up or push down to switch between parallel and series modes. Neat! You can’t mistake the Fender Classic Player Jazzmaster Special for anything but a full-featured jazz guitar. Though it’s certainly a versatile player that can deliver top-quality sounds for a variety of music genres, it’s in jazz where it truly shines. The Classic Player Jazzmaster Special is an electric guitar model based on the original Fender Jazzmaster. 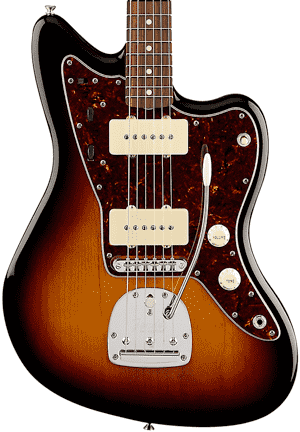 It’s got a number of contemporary upgrades that today’s players would surely love because they add to and not take anything away from the Jazzmaster’s classic style. The Classic Player Jazzmaster Special features an alder body that’s lightweight and offers a wide tonal range. It also has a maple neck with a new neck pocket designed to have a better neck pitch. The more pronounced neck angle not only improves the guitar’s stability and sustain but also enhances the performance of the bridge and tremolo. Topping the neck is a pau ferro fretboard that packs a lot of punch and provides a strong midrange presence. This Jazzmaster Special is equipped with Special Design Hot single-coil Jazzmaster pickups for those warm, fat and unmistakably jazzy tones. For tuning stability, this guitar has an Adjusto-Matic bridge, which also allows you to adjust string heights individually. The Gibson ES-335 enjoys the distinction of being the world’s first commercially sold thinline archtop semi-hollow electric guitar. It was first released in 1958 and has since been designed into different variants. For this list of the best jazz guitars, our pick would be the Gibson ES-335 Figured 2018 model. The 2018 ES-335 Figured semi-hollowbody guitar has a gorgeously figured maple veneer that is sure to turn heads. The maple/poplar/maple laminate at the top and back also packs in a lot of punch and a crisp tone. The center block of the guitar is also made of maple, while the bracing is made of spruce. The semi-hollow electric guitar also has a sturdy quartersawn mahogany neck that produces a warm tone and adds sustain. It has a rounded C shape and rolled binding for maximum playing comfort. The dark rosewood fingerboard with pearloid block inlays and the single-ply cream body binding enhance the guitar’s looks. The ES-335 Figured is equipped with MHS humbuckers – a rhythm pickup at the neck and a lead pickup at the bridge for those much-desired jazz tones. Other top specs include an ABR-1 bridge with titanium saddles and a hand-wired MTC Premiere control assembly. Another modern jazz guitar based on an iconic model is the Epiphone Sheraton-II Pro, which honors the company’s most influential archtop semi-hollow electric guitar. For those whose wallets simply cannot accommodate a Gibson, this Epiphone is probably the next best thing. The Sheraton-II Pro has a laminated maple top, back and sides. The neck is of a five-piece construction, with laminated hard maple and walnut layers. This setup makes the guitar lightweight and comfortable to play. The glued-in set neck also has a Sixties-era SlimTaper shape and it’s topped with a 22-fret pau ferro fingerboard (rosewood on some models). On the fretboard are traditional “block and triangle” mother-of-pearl and abalone inlays serving as position markers. Binding on the top, back, neck, headstock and F-holes add to the guitar’s visual appeal and overall durability. But this jazz guitar isn’t all about looks. Installed on the guitar are the highly praised ProBucker humbucking pickups, which are based on the Gibson BurstBuckers as well as vintage PAF pickups. A ProBucker-2 pickup is at the neck position while a ProBucker-3 pickup sits by the bridge. Thanks to the coil splitting feature (the controls are at the volume knobs), you can also access single-coil sounds. The Ibanez Artcore AS73 is another semi-hollow guitar we heartily recommend for everyone who’s always wanted a top-quality jazz guitar without the top-tier price. This model is not as flashy as the previous two models above – it has fewer cosmetic appointments, but that suits many players just fine, especially those who care more for the sound. This doesn’t mean the Artcore AS73 isn’t pretty to look at. On the contrary, its make, finish and overall craftsmanship are akin to that of a more expensive guitar. The top, back and sides are made of select maple, while the slim set neck is made of mahogany. The top and back are both arched for a richer, fuller sound and greater sustain and resonance. Topping the neck is a 22-fret fingerboard that is made of rosewood and features binding and pearl inlays. For the electronics, Ibanez fitted the Artcore AS73 with a pair of Classic Elite humbuckers. The humbucking pickups do their job of capturing the guitar’s expressive acoustic and electric tones fairly well. You may want to upgrade to better pickups in the future though – we’re sure the guitar won’t mind. Besides, the AS73 is a really great platform for upgrades. Time to get swingin’ with the Epiphone Emperor Swingster! This hollowbody electric has a truly classic style. It uses the same body and neck as the Emperor-II, the signature model of virtuoso jazz musician Joe Pass. The Swingster’s lightweight hollow body is made of maple laminate while the top is made of select spruce for a warm jazz tone. The neck is made of hard maple and it’s topped with rosewood fingerboard with 20 medium jumbo frets and pearloid rectangular block inlays. What makes this hollowbody jazz guitar extra special has to do with its electronics and bridge. The Epiphone Emperor Swingster is equipped with Epiphone SwingBucker pickups with Alnico-V magnets at the neck (Swingbucker) and bridge (Swingbucker Plus). The two push/pull tone controls allow players to change the output of each pickup individually – whether it’s series or parallel wiring you prefer is all up to you. The Swingster also has a LockTone “pinned” Tune-o-Matic bridge with a rosewood base and chrome saddles. Topping it all off is a licensed B30 Bigsby tailpiece. Other top specs include Grover machine heads, a pearloid vine inlay at the headstock as well as binding on the body, fretboard and around the F-holes. If you want to focus on playing jazz, not just any guitar will do. You need to choose a guitar that suits your music and playing style and of course, the jazz sound you’re after. The guitars on this list are all suited for playing jazz and even blues. If ever you have the opportunity to check out the jazz guitars above personally in a music store or if one of your friends has one, do try them out so you can get a good feel of things before you buy. After all, comfort is also key when it comes to choosing the best jazz guitar for you. What makes a guitar well, a jazz guitar? Truth be told, any electric guitar can be tweaked to have a tone that can be called “jazzy.” However, there are certain models of guitars that already have a good jazz tone right from the start because of their pickups and electronics or their construction. In this list, we’ve selected five guitars: the Fender Classic Player Jazzmaster Special with pau ferro fretboard, the Gibson ES-335 Figured, the Epiphone Sheraton-II PRO, the Ibanez Artcore AS73 and the Epiphone Emperor Swingster. These guitars are all electric guitars but they are of three different kinds. The Fender Classic Player Jazzmaster Special is a solid body guitar, the Gibson ES-335 Figured, the Epiphone Sheraton-II PRO and the Ibanez Artcore AS73 are semi-hollow guitars and the Epiphone Emperor Swingster is a hollow-body guitar. Solid-body jazz guitars like the Jazzmaster are a good transition guitar for those who already play electric guitar because its solid body is design that many are familiar with. They’re also usually lighter and smaller in shape, making them good options for beginners or young jazz players. Solid body guitars like the Fender Jazzmaster can also produce a wide range of sounds. The Jazzmaster in particular has pickups that are specially designed to capture those jazz tones. Semi-hollow body guitars have a solid block down the middle and partial cavities on each side. This makes them more resonant than guitars with solid bodies. Hollow-body guitars are closer to acoustic guitars in that they have a full body cavity. Hollows have a greater natural resonance and warmer tone that make them perfect for jazz music. There are some drawbacks with playing semi-hollow and hollow guitars, however. They’re prone to acoustic feedback – the result of a hollowed-out construction and soundwaves wreaking havoc on how pickups capture vibrations as if in an endless loop. Feedback usually happens when semi-hollow and hollow guitars are played close to the amp, when the tone is excessively overdriven and when the amp is big and loud. You don’t get feedback when you use a solid body jazz guitar. Does this mean you have to forget about the other guitars and choose a solid body? Not at all. There are many ways to combat feedback when playing a semi-hollow or hollow body guitar. Some guitar players stuff foam in the body cavities, some use noise suppressors and some simply move away from their amp. If you choose to have a semi-hollow or hollow-body jazz guitar and you value the tone and resonance it produces more than any feedback worry, go ahead. After all, it’s easy to seek the advice of other players regarding how best to reduce feedback, especially if you have the same model. If you’re on the hunt for the best jazz guitar, here are some tips to help you decide which one would fit your needs and preferences best. 1. Get inspiration from the greats. What did/does your favorite jazz artist play? What do other jazz musicians you’re inspired by play? There’s a reason why you’re drawn to their music, right? It could be their tone, their playing style, their skill – it’s also worth taking a look at their guitar so you can have something to base off on. You don’t exactly have to have the same model (if you can afford it, why not? ), but something that looks and/or sounds like it. It’s a good jump-off point when getting your own jazz axe. 2. Read and watch reviews. What are other guitar players saying about different jazz guitar models? Product descriptions are one thing, comments about real-world use are another. It will be helpful for you to be informed about how a particular jazz guitar performs in the hands of different players. Reviews from blogs, guitar sites, forums, product pages and YouTube are a good source of info about the pros and quirks of the jazz guitar models you’re considering to buy. 3. Try them out. Buying a guitar online is a great way to save money, but how do you make sure the one you’re getting is really ‘The One?” Try it out in a music store. Going to a music store lets you try out different jazz guitar models so you can see, feel and hear it in person. You can even find another model that’s a lot different from your first option but appeals more to you. Once you find the guitar you want, take note of the tag price and see how much it costs online, shipping included. More often than not online prices are lower, and some guitars even come bundled with accessories. We hope the information on this page helps you determine the best jazz guitar that would fit your musical preferences and playing style to a T. If the guitars on this list call to you, do learn more about them – watch a few demo videos, try them out in a shop and envision yourself playing them. We’re sure you’ll be able to make the right choice in due course. Have fun!